Michael heads up Canada Wide’s editorial team, with a special focus on custom publishing. He has worked as an editor and storyteller for more than 25 years with media outlets including Canadian Business, Alberta Venture and the Vancouver Sun. He has won or been a finalist for more than a dozen journalism awards, and was named the inaugural Editor of the Year by the Alberta Magazine Publishers Association in 2008. Michael specializes in putting complex ideas into formats and language accessible to a wide range of audiences. How will tech’s appetite for office space change downtowns? Along bustling Westlake Avenue, running up a gentle incline from South Lake Union to the highrise heart of Seattle, about half the lunch-hour pedestrians and patrons sitting on café patios sport the distinctive blue lanyard and badge of the Amazon.com Inc. employee. The world’s preeminent digital retailer and cloud services provider employs more than 30,000 people spread over 30 buildings here. And its presence is growing, in size and visibility. Between two of its newest office towers, Amazon is building a glass-walled conservatory in the shape of giant golf balls where employees will be able to hold meetings or just chill out, surrounded by tropical foliage. What the company is doing has generated so much curiosity that, in 2016, it began offering public walking tours of select buildings twice a week. Faced with a space crunch in 2009, tour guide Allison Flicker explains, founder and CEO Jeff Bezos and his team explored the option of relocating to the suburbs where Amazon might build its own campus in the fashion of its information technology peers like Microsoft Corp. and Apple Inc. But they decided to stay and grow in the central business district. The feedback from employees was that they overwhelmingly preferred to work downtown. It was easy to get to, especially for the 55 per cent of staff who didn’t drive to work. And it just had a better atmosphere, tied into a neighbourhood with a variety of restaurants and other amenities instead of sequestered in suburban isolation. Today Amazon is by far the largest private-sector employer in Seattle. The company issues maps to employees to help them find their way to its various buildings. Thanks to its policy allowing staff to bring their dogs to work—more than 2,000 dogs are registered—canine grooming salons dot the neighbourhood. And though this is downtown, spotting someone wearing a tie on the street or in an elevator is a rare occurrence. Amazon is by no means the only technology player transforming the downtown of a major city. In San Francisco, Salesforce.com will move into an eponymous 61-storey tower, the tallest in the city, in the spring of 2018. LinkedIn Corp. recently relocated its head office from Mountain View, California, to another new skyscraper by the Bay. Uber Technologies Inc. is also building a San Francisco headquarters, this one a midrise, but still 420,000 square feet. Zappos.com is almost single-handedly trying to revive the dowdy downtown of Las Vegas. The tech takeover has been observed beyond North America, too, in cities including London and Berlin. It’s even happening in China. Tencent Holdings Ltd., which developed the world’s premier messaging app, WeChat, is building side-by-side towers connected by walkways that will provide workspace for 12,000 employees in Shenzhen, just inland from Hong Kong. Perhaps not surprisingly, the complex is designed by the same architecture firm responsible for Amazon’s Spheres. The phenomenon is also happening in Vancouver, subtly changing the character of the city’s downtown in the process. Last year Microsoft Corp. took over two floors of the Nordstrom block anchoring the Pacific Centre mall. Where shoppers once browsed the aisles of Eaton’s (then Sears’s) B.C. flagship, today coders sip lattes and nibble healthy snacks between sessions working on OneNote, MSN and Skype for Business. Another 3.5-acre floor of the same building is occupied by animation and digital effects house Sony Imageworks. And with 1,300 staff filling a former fashion warehouse in nearby Yaletown, SAP is among the largest employers on the downtown peninsula, period. 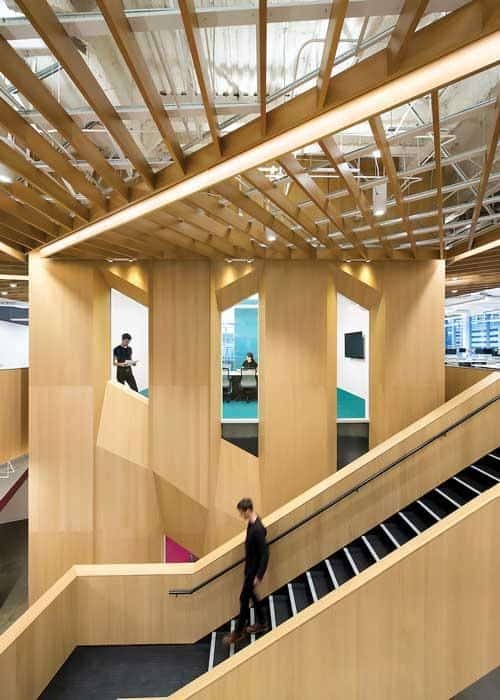 Information technology and digital media companies accounted for 36.7 per cent of the demand for office space in downtown Vancouver in the second quarter of this year, according to leasing company Colliers International (down from 42 per cent a year earlier). They already occupy 21.8 per cent of downtown office space, putting tech in league with finance and professional services as an occupant of space. That’s up from virtually nothing 20 years ago. The dot-com boom of the late 1990s was largely a suburban business-park phenomenon. Its nodes included Redmond, Washington (home of Microsoft), Burnaby (where Electronic Arts Inc.’s largest video-game studio has its own soccer pitch) and, for that matter, all of Silicon Valley. Many of these leafy redoubts remain tech hotbeds, but the industry’s recent expansion has almost all been in the centre of the city. Twitter Inc. set a Bay Area trend in 2012 when, upon going public, instead of decamping to the Valley as expected, it doubled down on San Francisco’s central business district. It took advantage of city incentives to spruce up a vacant art deco landmark on Market Street, the city’s distressed main drag. Twitter’s move wasn’t an unmitigated success; beset by earnings misses, the company is reportedly subletting 30 per cent of its space. But other tech companies, large and small, followed its geographical lead. Whereas the first tech firms to venture downtown came for character properties around the fringes with their bare brick walls and timber beams overhead, today’s downtown nouveau riche favour custom-built or -renovated AAA space. In Vancouver, IT firms have engaged in a kind of turf war, each looking for that iconic space and location that will appeal most to talented young hires. “I don’t think there’s a space like this in Vancouver,” boasts Edoardo De Martin, director of the Microsoft Canada Excellence Centre above the Nordstrom store. He cites the things millennial employees appreciate: good transit access, city amenities and, within the space, an open, collaborative environment where they’re not chained to a desk. “This space is more amenable to the demographic we’re hiring,” De Martin says. 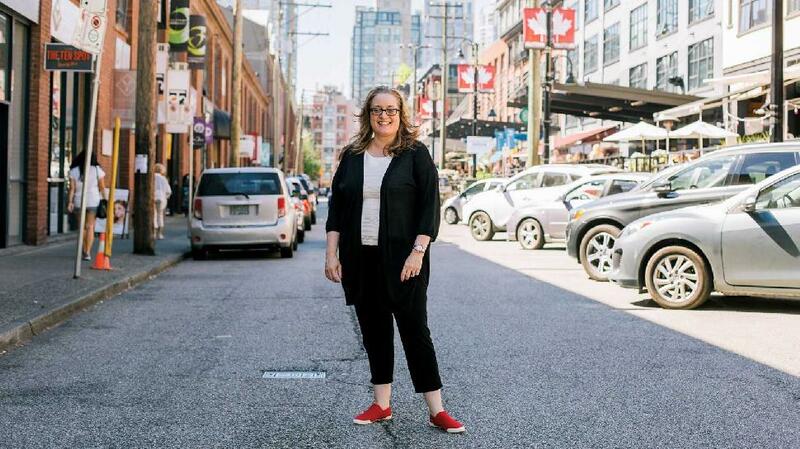 When SAP Labs Vancouver (which was founded as Crystal Services and has gone through a series of owners including Seagate Software, Crystal Decisions and Business Objects) set up shop downtown in the 1980s, it was an anomaly in IT, recalls managing director Kirsten Sutton. But even then the location “was a huge attractor of talent,” she says. It just made life simpler for young programmers who already gravitated to apartment living in the city. 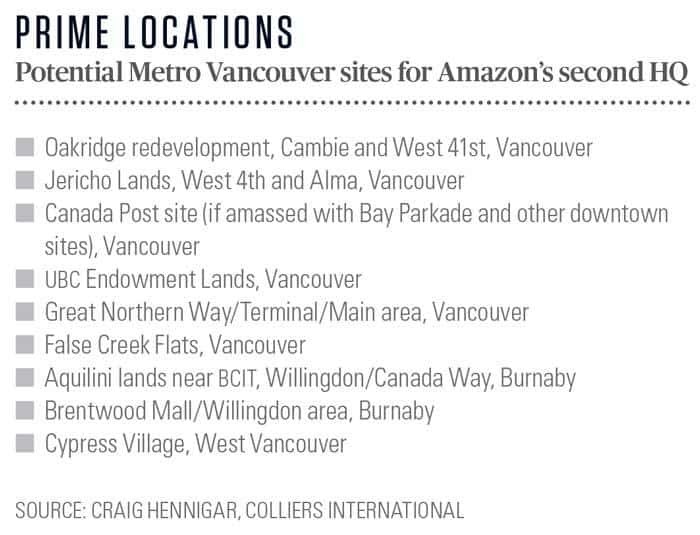 Many of those early hires now have families and live in the suburbs, Sutton says, but even for them the company’s Yaletown site is accessible by transit at all hours. As for more recent hires from the millennial generation, the central location is pretty much expected. Only 16 per cent of employees at SAP Labs drive to work. Many, especially the younger ones, don’t own a car at all. SAP just renovated the space over the past two years and signed a new 10-year lease. Instead of building a cafeteria, as the German multinational has done at most of its other offices around the world, SAP Labs Vancouver runs a program called Lunch on Us whereby employees receive a gift card they can use at any of 52 restaurants in the surrounding neighbourhood. “When a new restaurant opens in Yaletown, right away they are knocking on our door wanting to be on that card,” Sutton says. But there are reasons to believe tech’s urban invasion will be permanent, and transformative to the city landscape. In 2011, venture capitalist Marc Andreessen wrote a much-shared op-ed column in the Wall Street Journal that expounded his view of “Why software is eating the world.” IT developers were devising new ways to deliver goods and services to customers that would see them take over swaths of the economy, Andreessen argued, using the examples of Amazon, Netflix and Apple’s iTunes. (Uber wasn’t even around yet.) Instead of working in factories, in the future people will increasingly work in offices developing the software to run the robots that do the factory jobs. Six years later, Andreessen’s scenario appears to be playing out. Conventional revenue figures tend to underestimate the impact of the technology industry, partly because many players are in the pre-commercialization stage. But The State of Canada’s Tech Sector, 2016 by the Brookfield Institute, a Toronto-based think tank, uses some different methodology to show that technology is a far greater force in the Canadian economy than widely thought. Tech represents $117 billion in gross domestic product, or 7.1 per cent of the overall economy, the report states, putting it fifth among all industries—after real estate, manufacturing, mining/oil and gas, and construction. Its 71,000 firms (6.1 per cent of all companies) employ 864,000 people (5.6 per cent of the national labour force) and account for the lion’s share of private sector research and development, at $9.1 billion. In Vancouver and Halifax, tech is second only to retail trade as a source of employment. What Andreessen and other heralds of the tech takeover didn’t anticipate, or were less interested in, was just where this new post-industrial workforce would want to be located. And make no mistake, some notable non-technology companies—McDonald’s Corp. and Kraft Heinz Co. in Chicago, General Electric Co. in Boston—have also been making the trek downtown from the burbs. North American downtowns are generally cleaner, safer and more appealing to all kinds of enterprises and their workers than they were a few decades ago. But these other industries don’t have the same potential as technology to transform the urban landscape, for a couple of reasons. First, technology was never downtown in a big way before now. IBM Corp. was founded in upstate New York; Hewlett-Packard Co., in a Palo Alto garage. So the industry’s incursion into downtown office space is unprecedented. Second, where companies in other industries might just locate head-office functions such as finance, legal and marketing in their highrise urban HQs, tech companies bring the people who actually create the core product or service. Amazon expects to have 50,000 employees in Seattle by 2026—more than aerospace titan Boeing Co., long the metropolitan region’s leading employer, ever had in suburban Everett, Washington. Indeed, it foresees a day when it will outgrow the city, floating a plan to establish a second headquarters in another North American city. It’s as if North America’s industrial heartland is increasingly accessed by elevator. ing and retaining companies at every stage of their development. Research by urban theorist Richard Florida indicates that San Francisco now attracts more venture capital investment than all of Silicon Valley, while New York City has in recent years emerged as a leading startup hub. 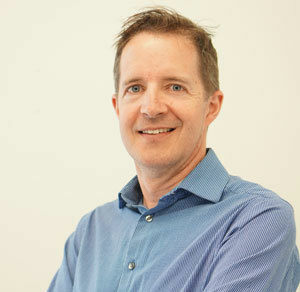 In a paper published this year, Startup City: The Urban Shift in Venture Capital and High Technology, the University of Toronto professor found correlations between VC investment and social diversity—the prevalence of gay people and immigrants, for example—but not with some assumed lures, such as medical centres and universities, more commonly found in outlying communities. Earlier generations of coders were content to drive 45 minutes or more to a suburban campus, but the millennials that companies are hiring today prefer to live and work in the city, leasing agent Carlson says. They want easy, 24-hour transit access and amenities such as restaurants, bars and fitness clubs in close proximity. Tenants in IT commonly ask for things like secure bike storage and showers, along with large floorplates amenable to collaboration. Compared with finance or professional services tenants, they fit more workstations in a given area yet also demand more amenity space. More than just landlords are having to adapt to the tech industry’s arrival. The influx of technology workers has Dunn’s Tailors selling more casual shirts and pants than it used to, says Jordan Smith, general manager of the 81-year-old downtown Vancouver haberdashery. “IT guys aren’t suits,” Smith says, though he’s had people run into his shop in a panic saying they have a meeting in Toronto the next day and need to buy one. If there’s a problem, it’s that a few tech-happy cities like Vancouver and Seattle may get too much of a good thing and lose some of their diversity and vitality as a result. It wasn’t just the employees’ preference that prompted Amazon to stay downtown back in 2009. CEO Bezos had his own reasons: he thought the suburban option would stifle workers’ creativity and disconnect them from their customers. “Jeff believed that, working in a city, they are more vibrant and engaged because they are not surrounded by folks who are working at Amazon. They are around people who work at other companies who have many other different kinds of jobs,” tour guide Flicker says. Amazon’s current expansion plans, however, call for this one company to occupy more than a fifth of Seattle’s downtown office inventory (some 10 million square feet) by 2019. As the ever-larger tech industry clusters in urban cores, the people tech workers encounter on the street and in the elevators may stop looking so diverse and start to look increasingly just like them. With just one click, Amazon.com Inc.’s request for proposals for a new headquarters triggered what may be the biggest corporate relocation lottery in history. At press time, Vancouver and more than 100 other Canadian and U.S. cities were vying for the coveted prize. The Seattle-based retail giant will announce the lucky winner next year. With its high housing costs and tight land supply, what are Terminal City’s chances of playing host to an 8.1-million-square-foot HQ teeming with some 50,000 employees? Add Canadian selling points like multiculturalism and government-funded health care, and Vancouver could have a significant edge on U.S. rivals. Amazon has 5,000 openings for software developers, according to commercial real estate firm Colliers International. “You’re not going to fill that immediately anywhere so being able to source globally is probably a very important issue,” says Craig Hennigar, director of market intelligence, Canada, with Colliers, adding that Vancouver’s openness to immigration is attractive. Although currency exchange differences could reduce the company’s costs, one of the biggest savings for businesses in Canada is on health care. 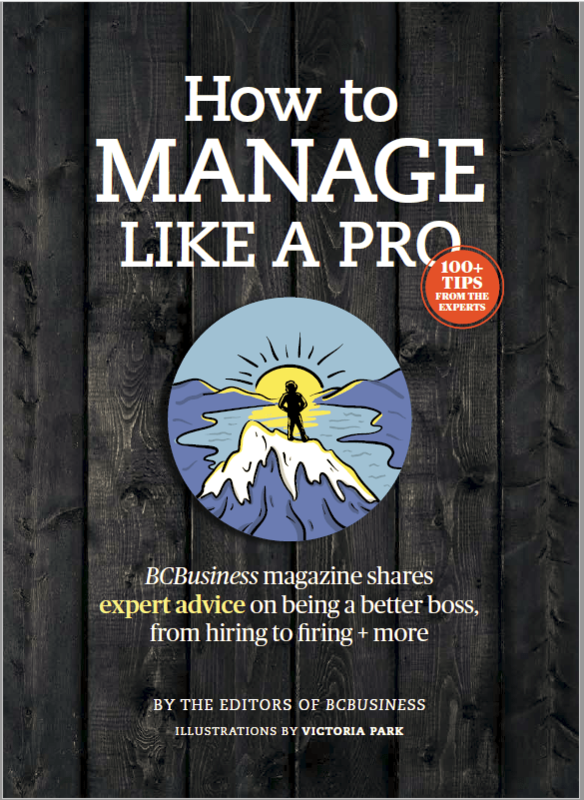 “There’s huge issues in the United States for health coverage—government health care just isn’t there for the masses like it is here,” notes Anthony Ariganello, president and CEO of Chartered Professionals in Human Resources B.C. & Yukon. Among the obstacles for Vancouver is finding a suitable site. Although there are some in the region (see below), municipal governments would need to allow significant density. The entire downtown core has only about 22 million square feet of office space.